It's taken nearly half a year for Lenovo's transforming IdeaTab S2110 to go from CES reveal to retail shelves and it's arrived barely unchanged. But despite the initial fanfare, the company chose to slip this slate into the marketplace quietly, ahead even of its official launch at IFA. In that time, ASUS managed to announce and ship a new hybrid tablet of its own, the Transformer Pad TF300 -- a keyboard-optional rival offering the same 10-inch, 1,280 x 800 IPS display and Android 4.0 experience, along with a quad-core Tegra 3. While Lenovo's offering may not come with four cores or an unskinned version of Ice Cream Sandwich, there is a very contemporary dual-core S4 inside, clocked at 1.5GHz and buffered by 1GB of RAM. Alongside that, the tab's also outfitted with a 1.3-megapixel front-facing shooter and 5-megapixel rear camera capable of 1080p video capture. Other specs include radios for WiFi and Bluetooth 4.0, a battery rated for up to 10 hours of browsing (augmented to 20 hours when connected to the dock) and either 16GB or 32GB of built-in storage. At $430 for the base model alone, it's already positioned as a higher-priced alternative to the TF300. Add the dock and full storage, and you're looking at a cool $580. So, will this be a case of "too little, too late" for Lenovo? Can the S2110 lure undecided customers away from cheaper similarly specced offerings? Read on as we attempt to answer all that and more. 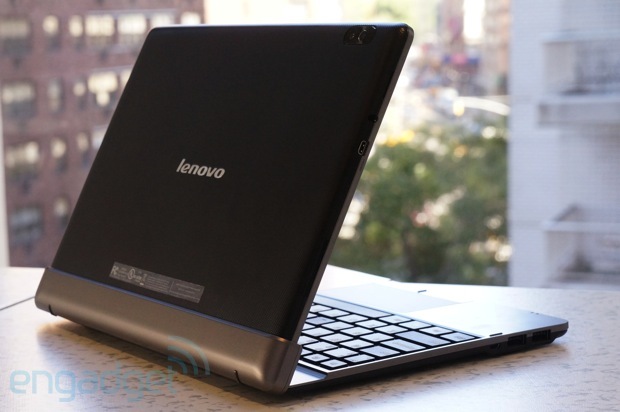 Lenovo IdeaTab S2110 review: a competent Transformer competitor running Android 4.0 originally appeared on Engadget on Tue, 16 Oct 2012 15:00:00 EDT. Please see our terms for use of feeds.